I created my first prototype of the BedBubble by connecting a long tube to the end of a heated fan that would provide a solution that was quieter and safer. My wife loved it and after building a couple other enhancements into the design, I found that other people loved it too. Today, BedBubble launched on Kickstarter with a funding goal of $25,000 to bring their under-the-blanket personal heating and cooling device to the market. BedBubble is comprised of a compact base and a flexible tube that pushes warm or cool air under a user’s blanket. The tube reaches between five and nine feet, and BedBubble’s compact base houses an ultra-quiet motorized fan that powers air through the tube. 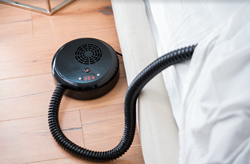 The low volume of the fan is perfect for getting a soothing night’s rest. An easy-to-use control panel lets users change the temperature and set timers to automatically turn the device off after a certain period of time. The warm setting heats up to 105 degrees Fahrenheit and, alternatively, turning the temperature all the way down will blow fresh ambient air to cool off and dissipate heat and sweat. Starting at $79, BedBubble is the convenient and affordable solution to those who wish to be warmer or cooler in their home. To pre-order, visit pr.go2.fund/bedbubble. The team behind BedBubble believes that the home should be a place filled with relaxation and comfort, and the company is passionate about helping people live in an environment that reduces stress. BedBubble is aiming to make the world a better place, one bubble of comfort at a time. To learn more, visit http://producthype.co/bedbubble.